NEW YORK (AP) — Charles Krauthammer, the Pulitzer Prize-winning columnist and pundit who helped shape and occasionally dissented from the conservative movement as he evolved from “Great Society” Democrat to Iraq War cheerleader to denouncer of Donald Trump, died Thursday. Sometimes scornful, sometimes reflective, he was awarded a Pulitzer in 1987 for “his witty and insightful” commentary and was an influential voice among Republicans, whether through his syndicated column or his appearances on Fox News Channel. He was most associated with Brit Hume’s nightly newscast and stayed with it when Bret Baier took over in 2009. Krauthammer is credited with coining the term “The Reagan Doctrine” for President Reagan’s policy of aiding anti-Communist movements worldwide. He was a leading advocate for the Iraq War and a prominent critic of President Barack Obama, whom he praised for his “first-class intellect and first-class temperament” and denounced for having a “highly suspect” character. 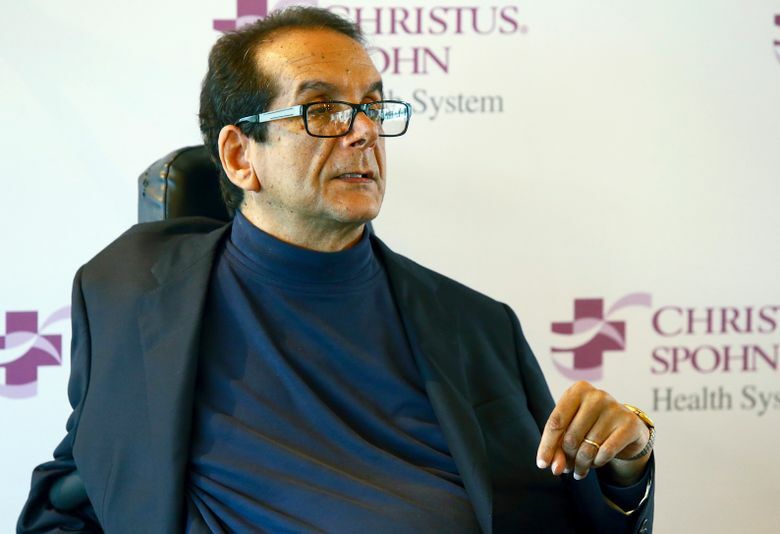 Krauthammer was a former Harvard medical student who graduated even after he was paralyzed from the neck down because of a diving board accident, continuing his studies from his hospital bed. He was a Democrat in his youth and his political engagement dated back to 1976, when he handed out leaflets for Henry Jackson’s unsuccessful presidential campaign. But through the 1980s and beyond, Krauthammer followed a journey akin to such neo-conservative predecessors as Irving Kristol and Norman Podhoretz, turning against his old party on foreign and domestic issues. He aligned with Republicans on everything from confrontation with the Soviet Union to rejection of the “Great Society” programs enacted during the 1960s. “As I became convinced of the practical and theoretical defects of the social-democratic tendencies of my youth, it was but a short distance to a philosophy of restrained, free-market governance that gave more space and place to the individual and to the civil society that stands between citizen and state,” he wrote in the introduction to “Things That Matter,” a million-selling compilation of his writings published in 2013. For the Post, Time magazine, The New Republic and other publications, Krauthammer wrote on a wide range of subjects, and in “Things That Matter” listed chess, baseball, “the innocence of dogs” and “the cunning of cats” among his passions. As a psychiatrist in the 1970s, he did groundbreaking research on bipolar disorder. He criticized the death penalty and rejected intelligent design as “today’s tarted-up version of creationism.” In 2005, he was widely cited as a key factor in convincing Bush to rescind the Supreme Court nomination of the president’s friend and legal adviser Harriet Miers, whom Krauthammer and others said lacked the necessary credentials. And he differed with such Fox commentators as Bill O’Reilly and Laura Ingraham as he found himself among the increasingly isolated “Never Trumpers,” Republicans regarding the real estate baron and former “Apprentice” star as a vulgarian unfit for the presidency. In the late 1970s, while a psychiatric resident at Massachusetts General Hospital, a professor with whom he had researched manic depression was appointed to a mental health agency created by President Jimmy Carter. Krauthammer went, too, began writing for The New Republic and was soon recruited to write speeches for Carter’s vice president and 1980 running mate, Walter Mondale. Carter was defeated by Reagan and on Jan. 20, 1981, Reagan’s inauguration day, Krauthammer formally joined The New Republic as a writer and editor. “These quite fantastic twists and turns have given me a profound respect for serendipity,” he wrote in 2013. “A long forgotten, utterly trivial student council fight brought me to journalism. A moment of adolescent anger led me to the impulsive decision to quit political studies and enroll in medical school. A decade later, a random presidential appointment having nothing to do with me brought me to a place where my writing and public career could begin. AP Television Writer David Bauder contributed to this report.